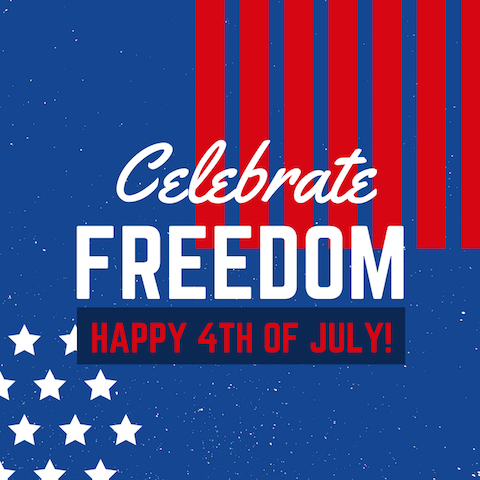 Make your 4th of July celebration a day to remember. 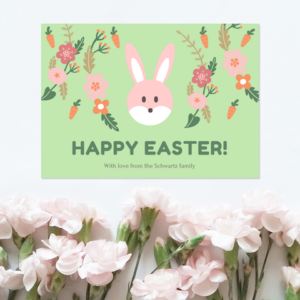 Browse through our excellent round-up of imagery, templates, and designs to find ideas and inspiration for your eats, drinks, favors, and decorations. 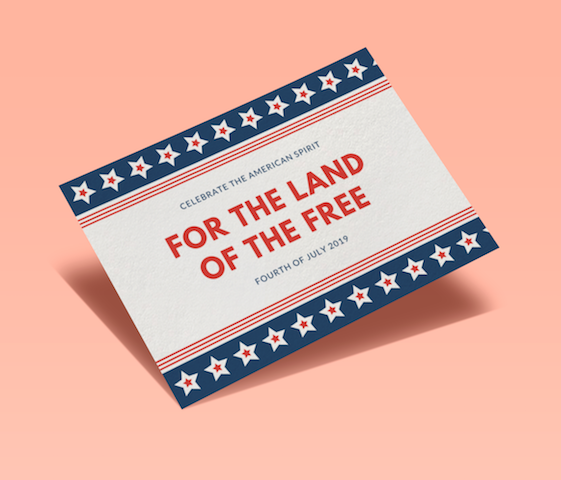 From festive invitations to heartfelt greeting cards, our massive selection of templates and design has everything you need for your Fourth of July festivities. 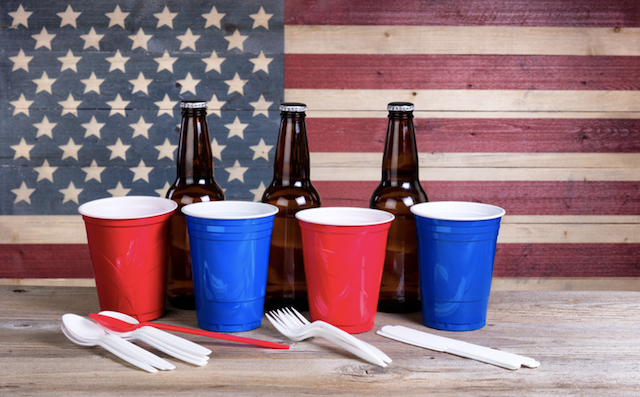 Throw a spectacular Fourth of July party that’s bound to wow everyone. 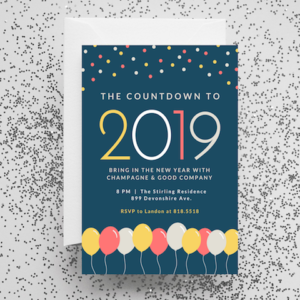 From festive decorations to delicious desserts, our collection of excellent imagery and designs will get you inspired to host an unforgettable summer soiree! 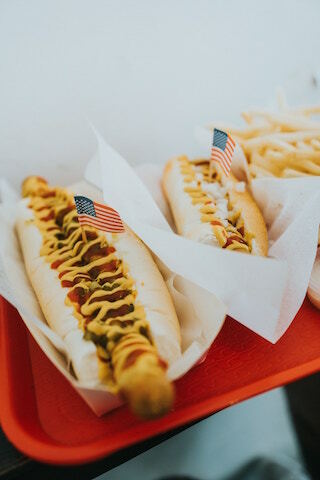 Hot dogs are a must-have at any Fourth of July celebration! Drizzle them with your favorite sauces and top them off with savory relish to enhance the flavor. 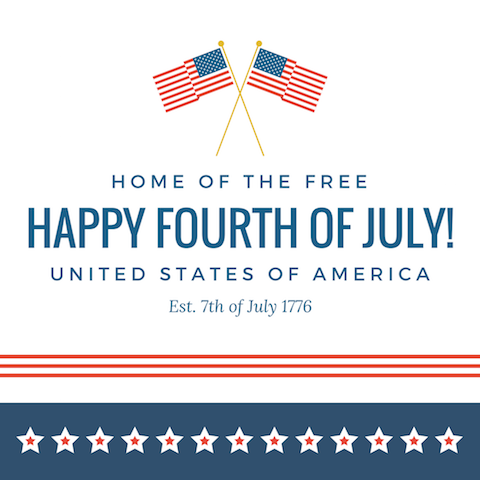 Greet everyone a happy Fourth of July with this awesome Pinterest graphic! Perfect for the occasion, this design features the food, drink, and party favor essentials in a red, blue, and white color palette! Get your Fourth of July party started with boozy bevvies! 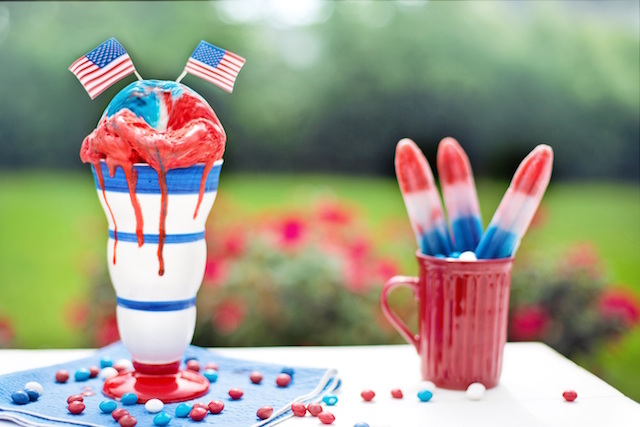 Pour them in red and blue cups that will go perfectly with the patriotic theme. 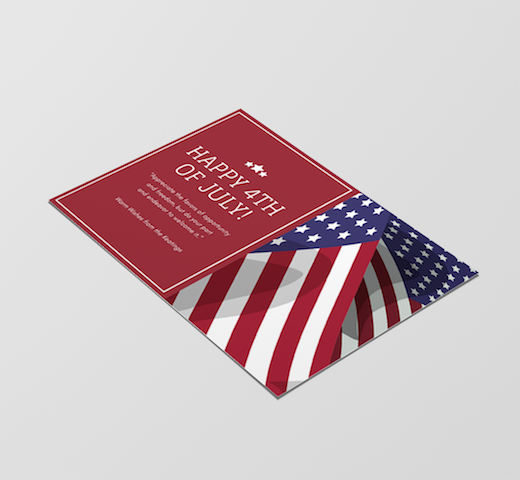 Spread the festive spirit all around on the 4th of July with this excellent greeting card! 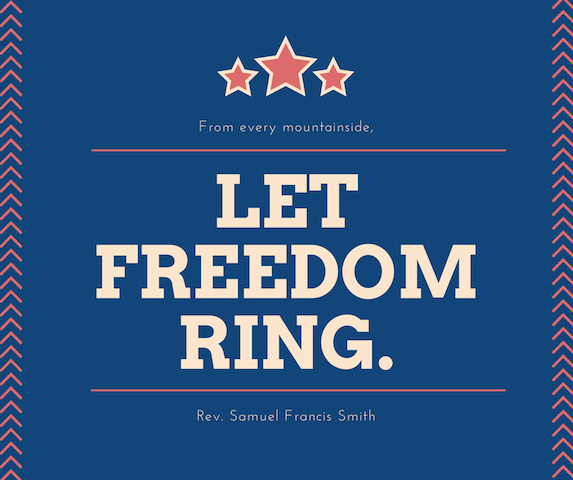 Featuring dark red overlay with the star-spangled banner, this design is the perfect pick for the holiday. 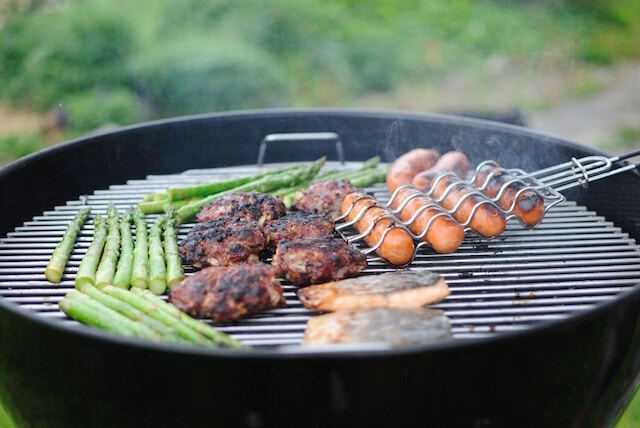 Break out the grill- it’s time for some barbecue! Host a cookout on the Fourth of July and watch your party guests satisfy their cravings with your flavorful feast. 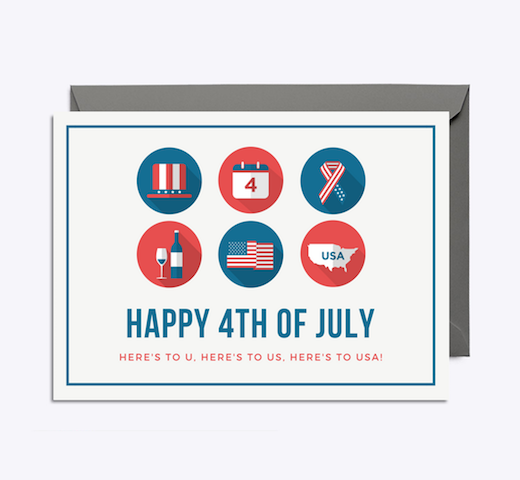 Set a festive mood for the Fourth of July with this greeting card that features illustrations of the holiday’s essentials. 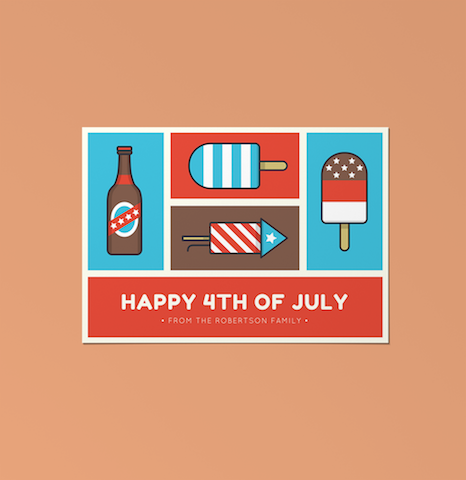 From fireworks to popsicles, this design has it all! 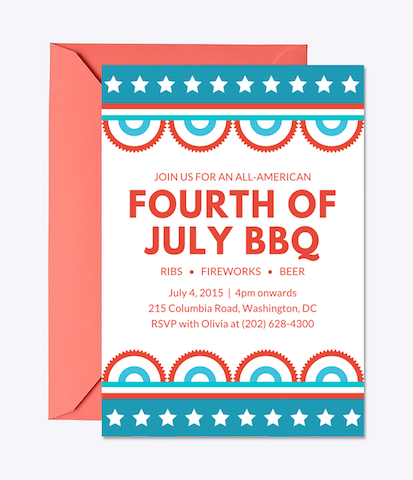 Invite everyone to celebrate the Fourth of July with BBQ, beer, fireworks, and you using this awesome invitation. 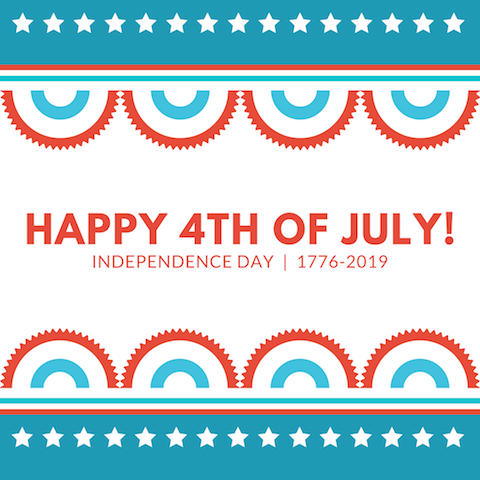 Simple yet eye-catching, this design takes a cue from the star-spangled banner! 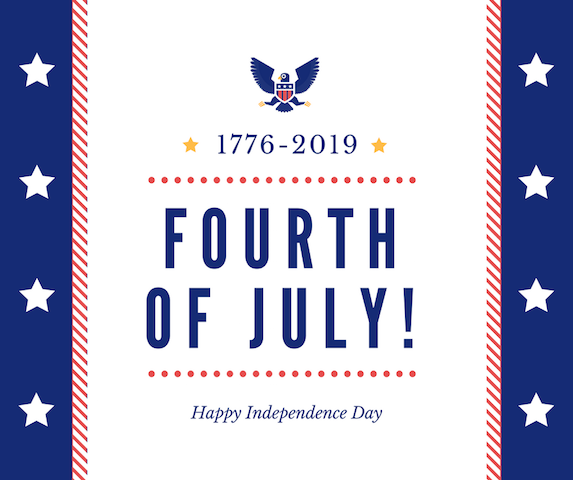 Craft a spirited card that’s perfect for greeting your family and friends a happy Fourth of July! Featuring fun icons in red, blue, and white, this design is just the right one for your needs. 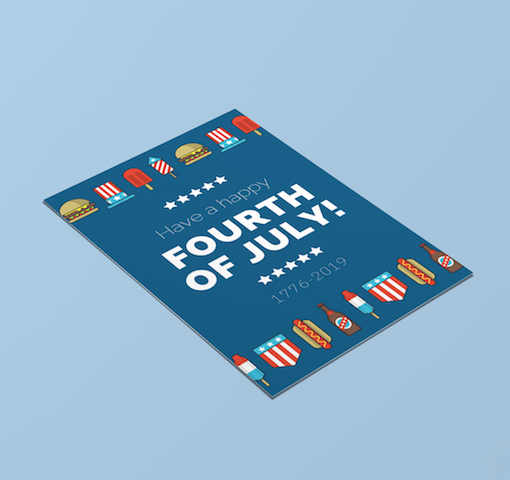 Spread fun and festive vibes this Fourth of July with this greeting card. This design takes inspiration from the star-spangled banner with its star and stripe details and color palette. 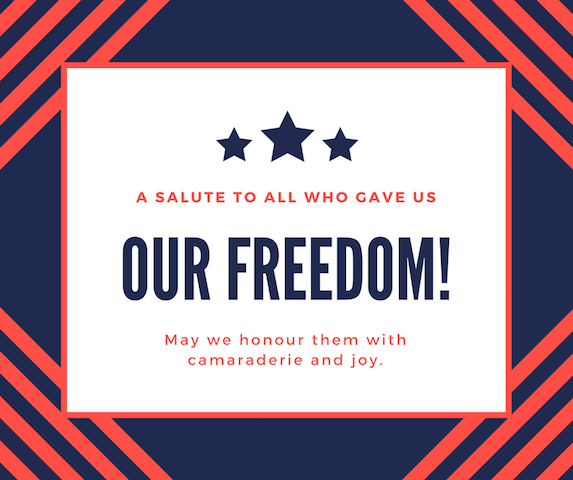 Cheers to freedom and fireworks this Fourth of July! 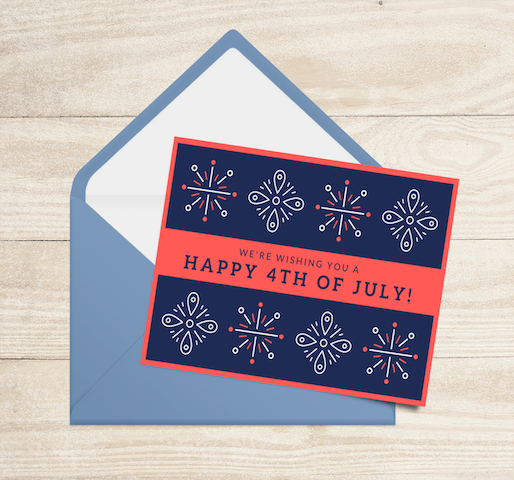 Fun and festive, this greeting card features artsy fireworks in red, blue, and white that easily pop against the black backdrop. 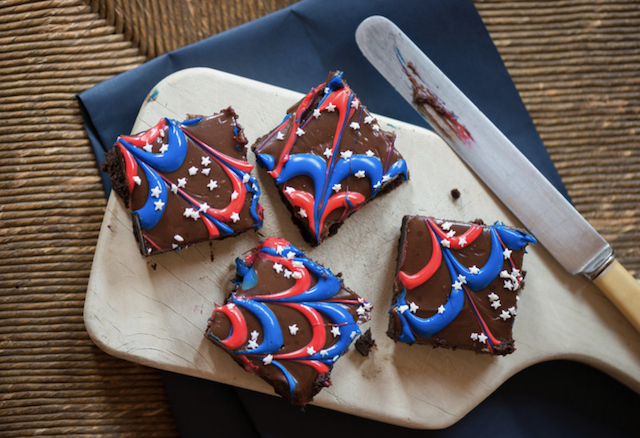 Make a sweet statement at your Fourth of July celebration with decadent brownies! Drizzle red and blue icing, and finish off with white sprinkles to add a festive pop to your brownies. Get your guests in the festive mood withstarry and striped eyeglasses in red, blue, and white. They also make awesome party favors for your Fourth of July festivities! 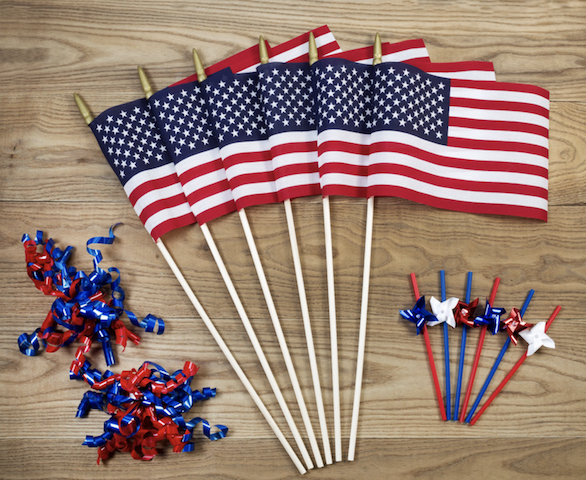 Pinwheels, streamers, and flags are must-haves for any Fourth of July party. 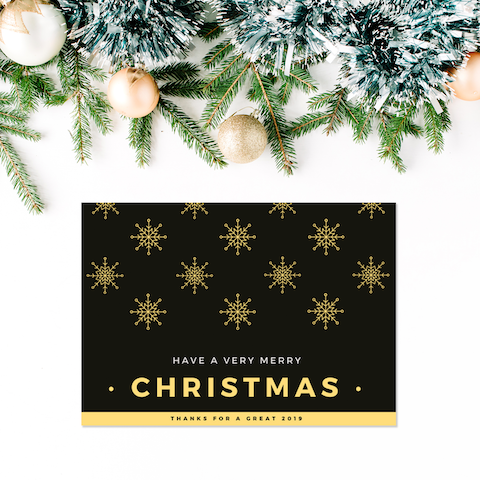 Get them in the festive color scheme of red, blue, and white to go with your theme! 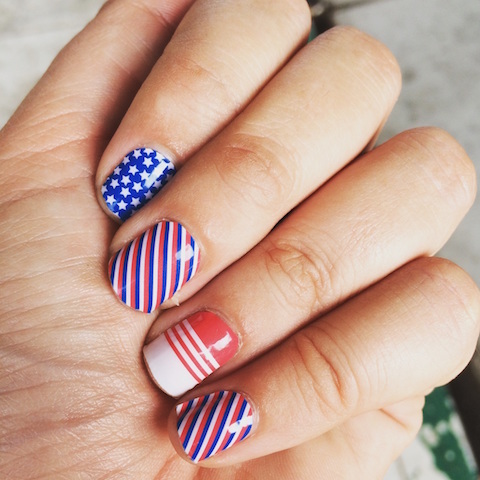 Get creative with your nail art this Fourth of July! Recreate this design by using red, blue, and white colors with different patterns of stars and stripes. Add glitz to your party venue, table, and desserts with glittery star decorations in red, blue, and white colors. 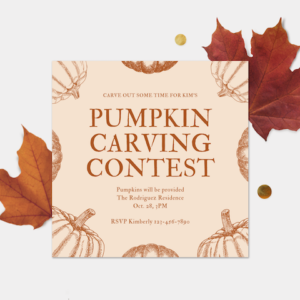 Artsy details like this will make a great addition to your festivities! 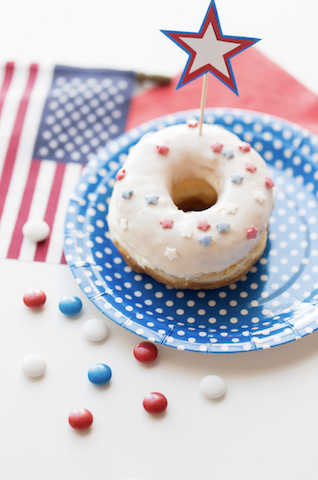 Whip up decadent glazed doughnuts for your Fourth of July party guests! Top them with star sprinkles and garnish with star toppers to create a festive vibe. 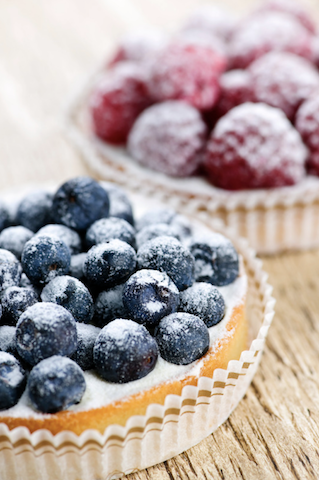 Sweet and indulgent, blueberry and raspberry tarts are sure to be a hit at your Fourth of July festivities. Finish off the fruit tarts with a dusting of sugar to send them over the top! 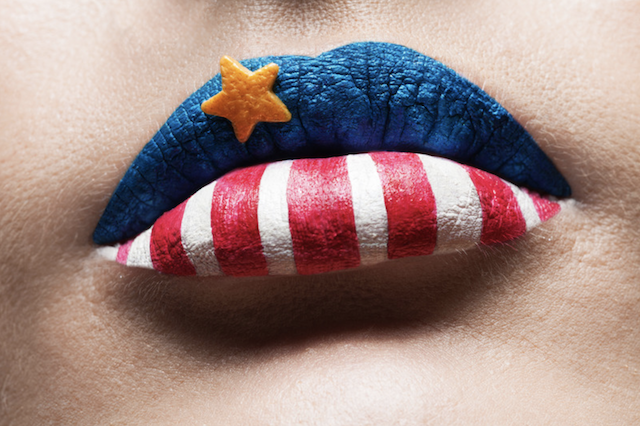 Inspired by the star-spangled banner, this creative makeup is ideal for a Fourth of July party with its stripe details, star accent, and red, blue, and white lip colors. Balloons are absolutely essential at your Fourth of July festivities. 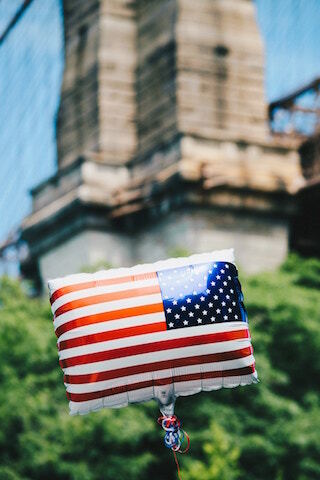 Inspired by the star-spangled banner, this awesome balloon is perfect for completing your party theme! 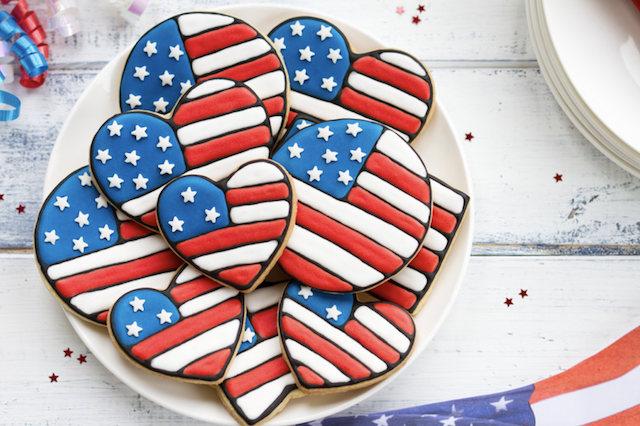 Turn cookies into festive treats for your Fourth of July party. 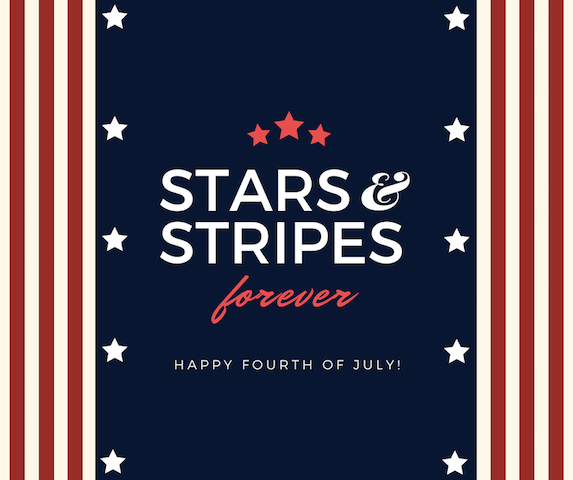 Take inspiration from the star-spangled banner and recreate the stars, stripes, and color scheme! 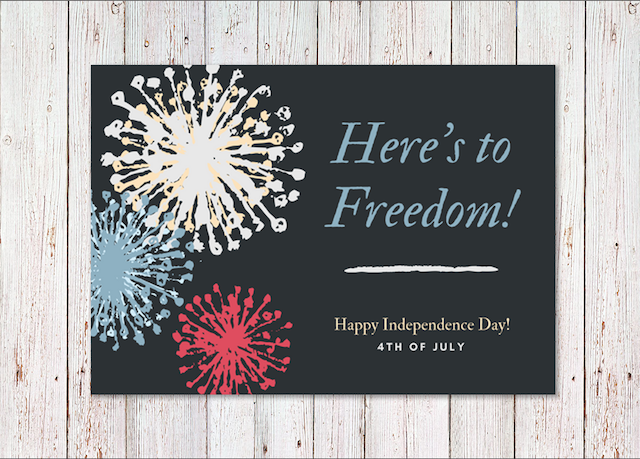 Fireworks are a spectacular overhead display as they are a creative decor for your card. 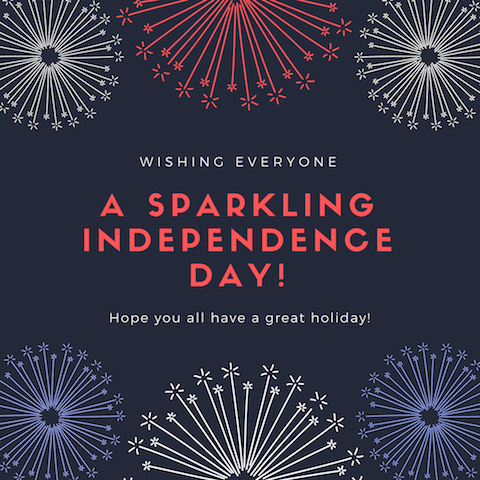 Wish your loved ones a sparkling Fourth of July with this fantastic greeting card! 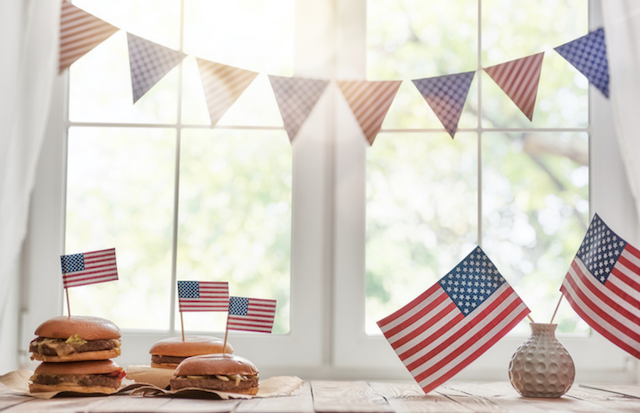 Invite your guests to feast on mouth-watering burgers that are garnished with mini star-spangled banners! Don’t forget to get red and blue pennants to hang around your party venue. Make sure your entertaining essentials match your Fourth of July theme with red, blue, and white party decorations, favors, and desserts. 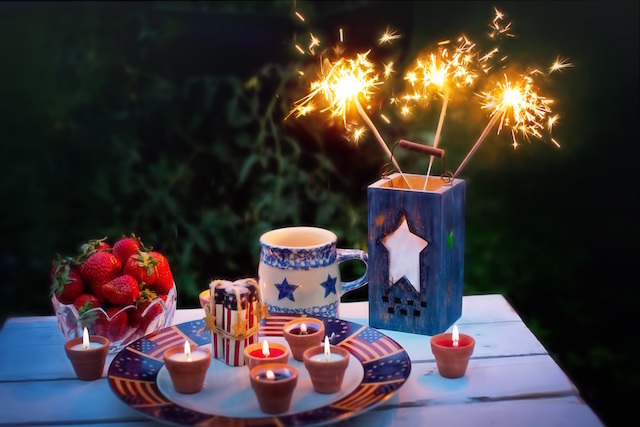 Add sparklers for that extra cheery flair! 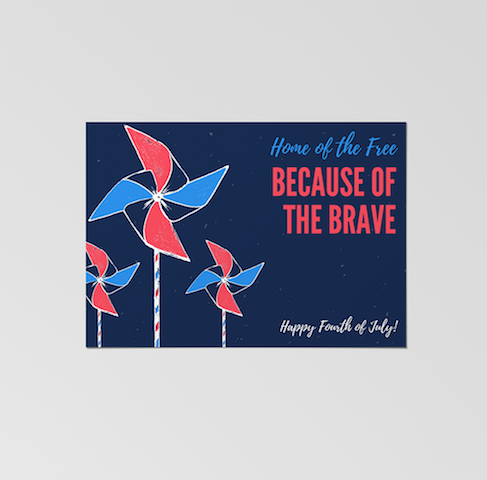 If you’re feeling extra patriotic this 4th of July, then here’s the perfect card to match your spirits. Simple and artsy, this design pairs a heartfelt quote with illustrated pinwheels in red, blue, and white. 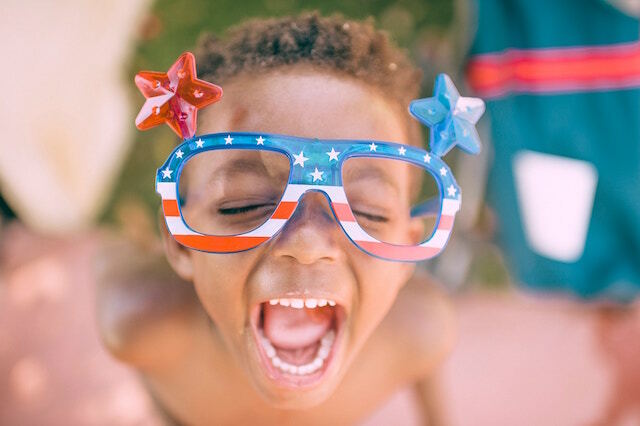 Celebrating the Fourth of July is so much better when you’re among family and close friends. 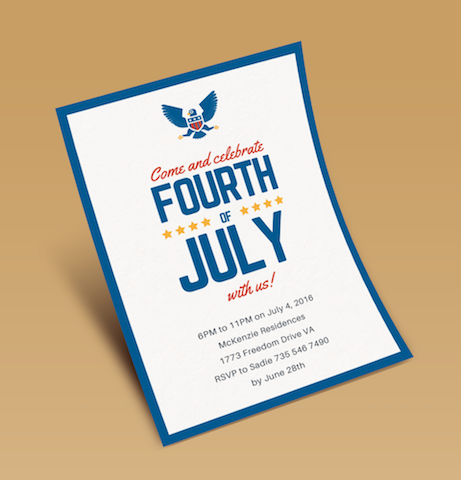 Make sure everyone comes to join you with this minimalist invitation featuring an eagle icon and solid blue borders. Make your cupcakes party-worthy with sugar stars, sprinkles, and frosting. Use red striped cupcake holders to complement the Fourth of July color palette you’ve got going! 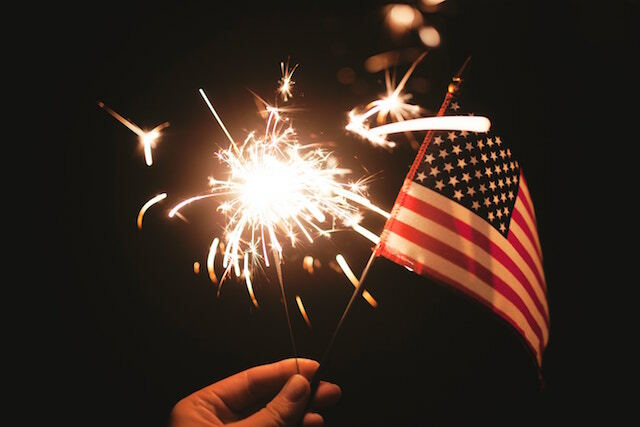 Send a warm note of thanks to the people who made your Fourth of July celebrations even more memorable. 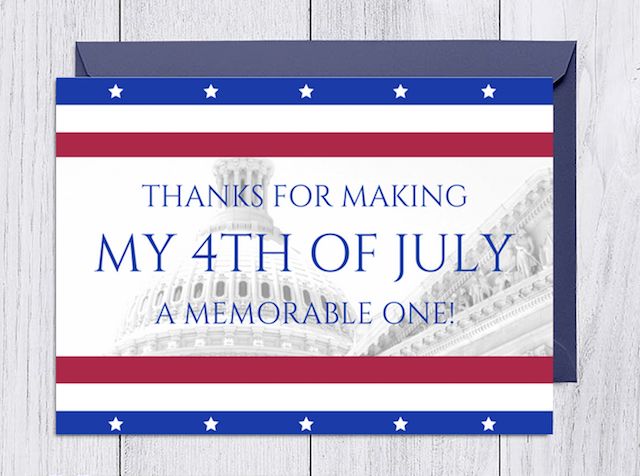 Featuring classic typography and patriotic hues, this card is just what you need! 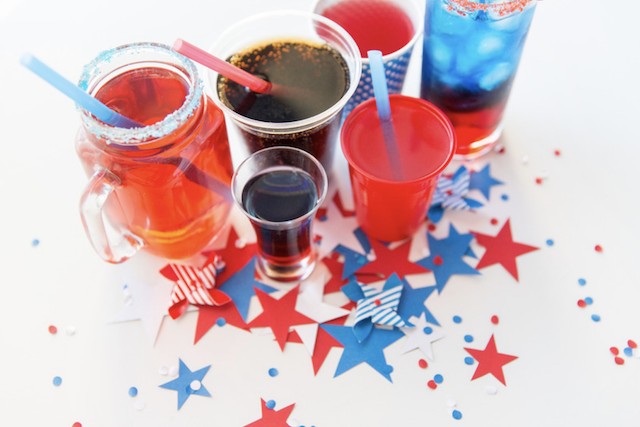 Get red and blue drinks to match with the color theme of your Fourth of July festivities! Then, dress up your beverages with red and blue straws to up the festive factor. There’s no such thing as too many fireworks at a Fourth of July party. Brighten up your festivities with sparklers that are sure to put everyone in a jolly mood. No Fourth of July celebration is complete without delicious burgers. 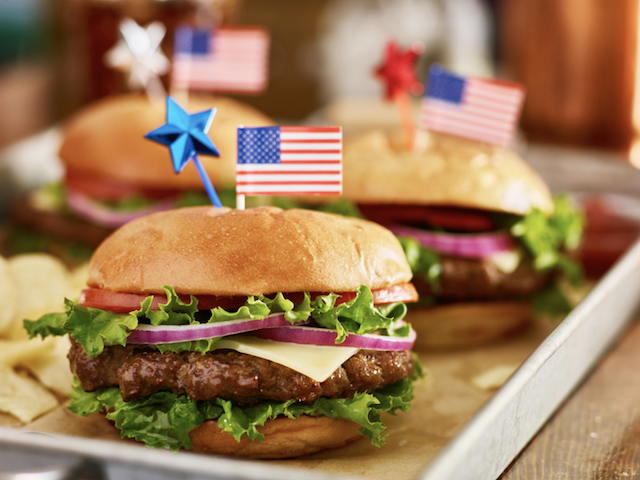 Create an all-star look for your burgers with star toppers and mini star-spangled banners. 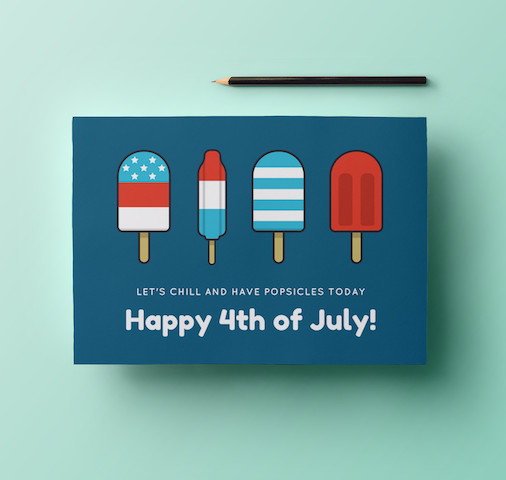 Celebrate the 4th of July with creamy popsicles and cool cards like this one. With its illustrated popsicles in red, blue, and white, this design hits a playful yet festive note! No one would be able to resist refreshing popsicles and delectable ice cream on a hot summer day. 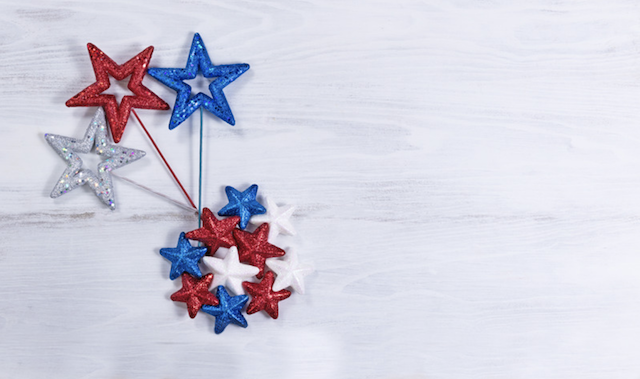 Make them in red, blue, and white colors to satisfy your Fourth of July party guests! 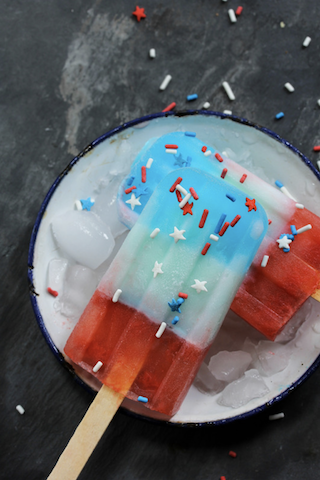 Red, blue, and white popsicles will leave everyone feeling nice and cool. These delicious frosty treats are perfect for refreshing your party guests on a warm day in July! 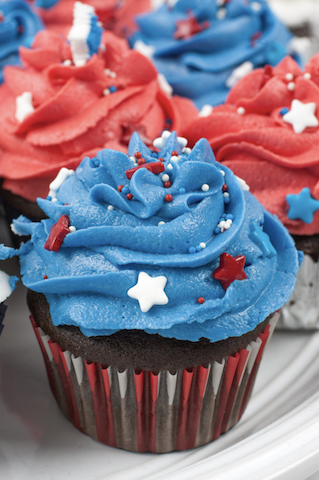 Serve up sweet treats in blue starry cupcake holders at your Fourth of July party. 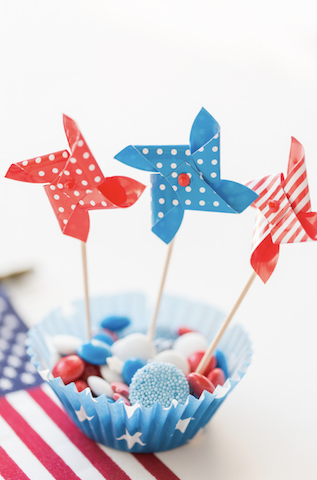 The fun pinwheels in red and blue add a festive touch to the candies! 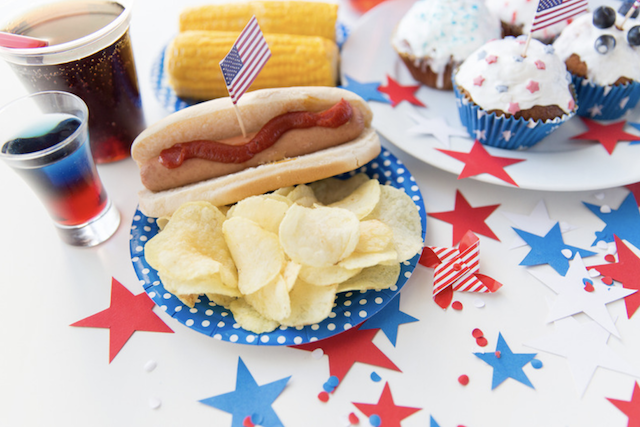 From cupcakes and hotdogs to chips and corn, you can easily prepare a mouth-watering spread that’s bound to impress your Fourth of July party guests.